The whole of the cheek, bentside and tail painting of 'The Triumph of Love' has suffered very badly at the hands of numerous restorers. The head of the putto depicted here has perhaps suffered less than the others and shows the hand of the brilliant painter who was initially responsible for the whole of this part of the decoration. The left hand of this putto can only be described as distorted and gross as the result of crude, unskilled overpainting and touching up. 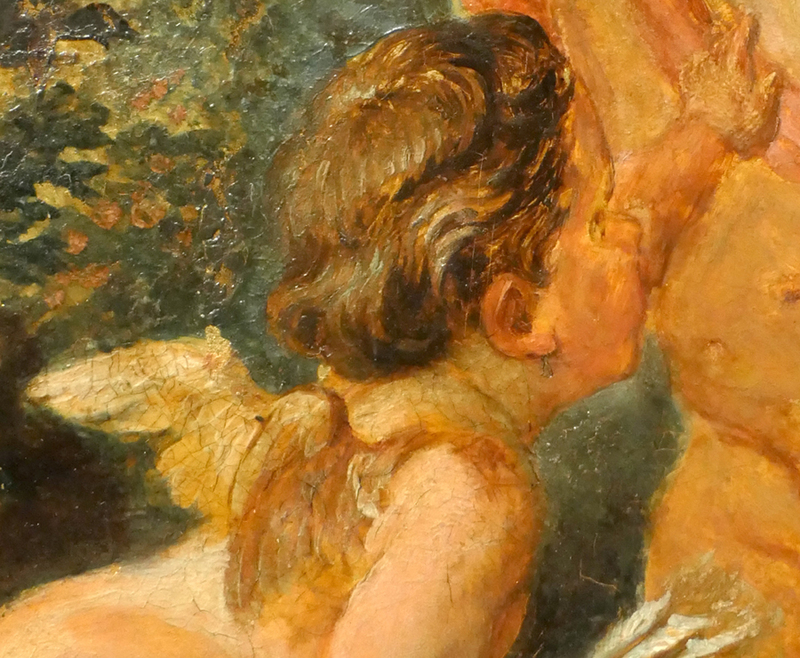 Although even in the head of the putto, the re-touching and over-painting is all too apparent, many important details remain: the highlights and detailing of the hair (except in the hair just above his forehead) and wings, and the painting of the ear with the highlight just at the top. But what is particularly noteworthy is the painting of the light reflected back off the body of the archer putto onto the face of this little brunette. This shows the skill of the painter in its highest and most sophisticated form. Although highlighted with light the face is painted with a dark outline to distinguish it from the flesh tones of the body of the archer putto just behind. In my view only a painter at the height of his/her powers could have painted this. What is needed now is to remove the overpainting and re-touchings from the faces and bodies of the other putti to see if there is evidence of this skill and technique lying hidden under the rest of the over- painting and retouching of 'The Triumph of Love'. This page was last revised on 10 December 2018.